SO, I generally do not watch television much at all, but there is a show that I have happened to catch on slow days of work that I just cannot look away from. 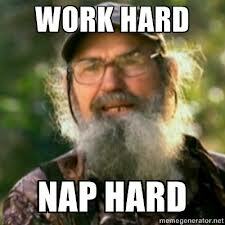 If you have seen Duck Dynasty, you will get where I am coming from. These self-confessed redneck millionaires can be highly entertaining and show us some of life’s simpler rules to live by. #1 We all need a little PLAY time – from lawnmower races, jousting on a Segway or taking a dip to cool off in the back of your own pickup truck, these guys know how to have fun. Schedule in some time to let loose and enjoy yourself! #2 Just be yourself – Living an authentic life, true to who you really are includes NOT trying to blend in. Don’t be average. Be the most exceptional version of yourself possible. If you are a redneck, duck hunting, duck-call designer, then be THE top in your game. Phil – The head of the family and creator of Duck Commander duck calls – does this with gusto. Check him out at this link. #3 Find your passion and run with it…in a big way. The creator of Duck Commander had a solution to a particular problem and he turned it into million dollar business and then some. #4 Never forget the importance of family. You are bound to these crazy folk by blood…so do your best to work with what you have. If you run your own business, it will give you some great skills to help you deal with your own team! Thanksgiving dinner can be a like a practicum in Conflict Negotiation 101.